Around 57 percent of 13.5 million electorate voted on Monday in 49 of the 243 constituencies in the first round of battle for political power in Bihar. The two main fronts soon claimed victory. It marked the start of an intense five-phase contest that will end on 5 November and whose outcome — to be known three days later — will prove whether Prime Minister Narendra Modi still retains his charisma or not. The second round of polling will be held on 16 October. The Bharatiya Janata Party (BJP)-led NDA is determined to oust the ruling JD(U) and its allies, the RJD and Congress who had formed a Grand Alliance. Additional Chief Electoral Officer R Lakshaman said the election passed off peacefully, with 57 percent voting. It was nearly 51 percent in 2010. Defying Maoist calls to boycott the elections, millions of men and women in both urban and rural areas trooped to polling booths in the 49 constituencies spread over 10 districts, officials said. Barring stray incidents, the balloting was largely peaceful. The Bihar battle is the biggest popularity test in the country after the Delhi election in February in which the AAP routed the BJP. Unidentified men fired at Lok Janshakti Party (LJP) candidate Vijay Kumar Singh in Jamui, but he was unhurt. Police arrested one of the attackers. Lakshaman told IANS that women voters outnumbered males in some places. As the voting progressed, Home Minister Rajnath Singh told IANS that Modi’s popularity had not waned, at least in Bihar. “I am campaigning in the whole of Bihar. I see no dent in the prime minister’s image. The people of Bihar still have confidence in him,” the former BJP president said, adding he was confident of a BJP victory. Minor incidents of violence came from Banka, Jamui and Bhagalpur districts. The BJP-led NDA alliance, which has three other parties including the LJP, is trying to dislodge the ruling JD(U). The BJP alliance also includes the Hindustani Awam Morcha and the Rashtriya Lok Samata Party. Voters in most polling booths said they would vote for development. “It is the only agenda that attracted me,” said voter Suman Kumar in Bhagalpur district. Giridhari Yadav in Khagaria said he would vote for Nitish Kumar. “Why should I vote for the BJP when we have tested Nitish Kumar? He has constructed roads, provided electricity, and set up schools and hospitals in rural areas,” he said. Samastipur, Begusarai, Khagaria, Bhagalpur, Banka, Munger, Lakhisarai, Sheikhpura, Nawada and Jamui districts voted in the first phase. 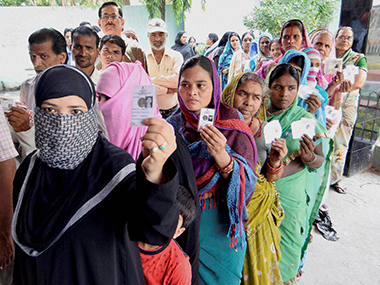 Officials said that voters in over a dozen villages in Samastipur, Bhagalpur, Jamui and Banka boycotted the polls and shouted slogans against what they said was lack of development. In areas of Maoist influence, the voting ended at 3 pm. The heavyweights in the fray on Monday included state LJP president Pashupati Kumar Paras, BJP ally HAM state president Shakuni Choudhary and Congress leader and former speaker Sadanand Singh. The JD(U) and the Rashtriya Janata Dal came together for this election after years of hostility.